The emergence of mankind in Peru dates back to approximately 20,000 years ago and is known as the cradle of civilization in the Americas. The first people were the Chivateros, hunters and gatherers (6000 or 5000 bc) living in the cities of Toquepala and Paijan. This led to the first agriculturists known as the Guitarreros which formed the first sedentary places at Chilcas and Paracas (5000 or 2500 BC). Many regional civilizations developed in pre-Incan times, culminating in the thirteenth century B.C. with the Chavin people who are known as the mother of the Incas. Throughout Peru, different civilizations developed at the regions of Chavin, Paracas, Moche, Nazca, Tiahuanaco, Wari and Chimu. During the twelfth and seventeenth century the Inca Empire was established with its capital located in the city of Cuzco. The empire had a theocratic monarchy with a stratified society that included a production system focused on the needs of the communities. In the year 1532, a small group of Spanish conquistadors led by Francisco Pizarro arrived in Cajamarca, Peru on a quest for bounties of the gold they heard they might find here. 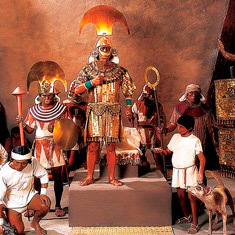 They eventually made their way to the inner circle of the Incas where they captured the Incan emporeror Atahualpa. In a trick of deceit they later killed Atahualpa after the Spanish had collected the ransom for his release. Along with the many abuses suffered by the Spanish and the death of their King great uprisings ensued. The Incans revolted many times but were defeated in 1935 upon which Lima the City of Kings was established. This symbolized the end of the conquest for the Spanish and was the start of early colonization. They built large monuments mostly in Lima, Cuzco and Arequipa, in a Renaissance style that evoked elements of gothic and boroque architecture. In 1820 the General Jose de San Martin landed in Paracas. On the 28 of July 1821 he began the war of the emancipation from the Spanish, proclaiming Peru's Independence. He later joined Simon Bolivar and together they won battles in Junin and Ayacucho in 1824, defeating the Viceroy Jose de la Serna and ending Spanish rule. Peruvian Independence gave way to the process of national organization. Peru is now a modern country that prides itself in rich history and diverse tradition and culture.